In the Emperor tarot card, a stoic ruler figure can be seen on his throne, which is adorned with the heads of four rams, representing his astrological sign - Aries. In one hand, he carries a scepter, representing his reign and his right to rule, and in the other an orb, a symbol of the kingdom that he watches over. The long beard of the emperor represents his vast experience; over time he has learned much about what it takes to rule, to establish power, authority and complete order for the benefit of his people. Behind him, the barren mountains shows his determination, his ambition for greater heights and his leadership capability. Contrast this with his complement, the Empress, whose flowing fields are filled with nurturing kindness. The Emperor instead rules with grit, strength and force. It s all about control when it comes to the Emperor, for this card means authority, regulation, organization and a fatherliness. The Emperor represents a strategic thinker who sets out plans that he must see through. He is a symbol of the masculine principle - the paternal figure in life that gives structure, creates rules and systems, and imparts knowledge. Where the Empress's desire for their kingdom is to create happiness, the emperor desires to foster honor and discipline. He guides with a firm hand, following the calling of the crown above all else. Though he is a ruler, he understands that to reign is also to serve - thus he acts rationally and according to what is for the greater good of the kingdom. He is a symbol of the masculine principle - the paternal figure in life that gives structure, creates rules and systems, and imparts knowledge. To see him in a reading presents a chance to grow in terms of the goals that you have set for yourself. It presents a successful future as long as you pursue your goals similar to the fashion that the Emperor does, methodically, and strategically. 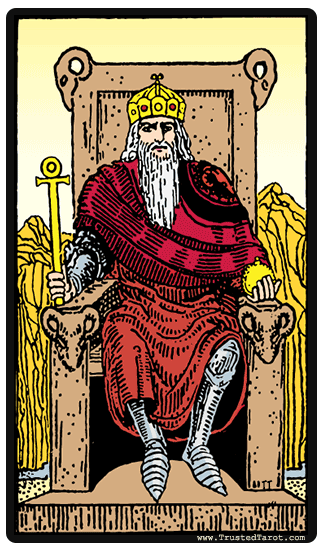 When you see him in a reading, a possible interpretation is that you could be put in charge of something important. It could be a position at work or in any kind of organization or institution that desperately needs order and a clear decisive mind. You may be called to act in the place of the Emperor, using his wisdom to bring clarity to the project. The Emperor reversed is a sign of abused authoritative power. In your social life, it can manifest in the overreach of power from a father figure or a possessive partner. In career readings, it could be coming from a superior. It presents a man who wants to take control of your actions and makes you feel powerless. It could also be that you are playing the part of a weak ruler, hatching a plan to avoid the tasks that come with having responsibility. Perhaps you aspire for a career that is more flexible than one that is governed by strict rules. Lack of self-control and inability to handle situations can be represented by the Emperor on a personal level. When he is reversed, the structures, rules and systems that he creates are no longer working. His desire to inspire higher principles in his kingdom have turned to ruthlessness, tyranny and rigidity. He seeks to dominate, forgetting his call from the crown to do what is best for his people, fearing only for his loss of control and thus creating suffering.